EntryLevel Landings offer ramped access for up to three paths of travel side approaches at door thresholds with the required federal maneuverable clearance area. 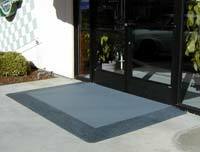 Made from 100 percent recycled tires, they offer a solid and safe transition while reducing risk, exceeding Occupational Safety and Health Administration and recommended Americans with Disabilities Act requirements with no load weight limitations. The landings also offer a distinct color change from the substrate to the transition providing a visual cue for the pedestrian. The landings are installed in less than an hour with high-grade adhesive, and is the ideal alternative to costly and inconvenient concrete demolition and construction.